It is no real secret that the goal for the majority of travel photographers is monetising travel. They try to make money so they can travel more often and for longer periods of time. Here are some of my best tips on how to monetise travel photography in 2019. If you are still at the beginning of your career as a travel photographer, you should not reinvent the wheel, but orient yourself towards the best. Here is a list of five very successful travel bloggers who earn a five figure income with their blogs. Study these blogs very carefully and learn from them. Discover how do travel bloggers afford to travel. Obviously you need your own travel blog if you try to monetise your travels like the bloggers mentioned above do. Treat your own travel blog as your home base. It should be the first place where potential customers may contact you. Show your very best pictures here and introduce yourself as an expert for travel photography. But how do you start a travel blog? As I said, do not try to reinvent the wheel. Learn from the best and use their methods. Matthew Kepnes, the most successful travel blogger of all times, offer a very high quality and affordable course about travel blogging on his website. He will not only show you the best methods to reach your goal as quickly as possible, he will also be at your disposal as your personal mentor. Don’t save in the wrong place and invest in this course. A combination of your travel blog and social media is the best way to boost your income from travel photography. Instagram is the most recommended social media site for travel photographers, but these days it is nearly impossible to get a decent amount of followers as a newbie. Instagram wants you to book paid advertisements, so the service will severely limit your reach. You start here with the handbrake on, so to speak. For this reason I always recommend Pinterest for beginners. Within a few days I was able to get a couple of hundred followers and over a million views. On Instagram it would take at least six months (without using bots, paid advertising and dubious hacker tricks). On social media, my advice would be that you post only samples of your photographs and then redirect people to your website where the main photographs are. To stand out from the crowd of travel photographers and travel bloggers, you should commit yourself to a certain thing. The most successful travel photographers specialize in a subject that moves many people and triggers strong emotions. For example, child poverty in Bangladesh, the extinction of animals or the effects of climate change. With topics like these, you can quickly find other people who are interested. Network with these people and build your tribe. Ask them for support for your project. A very easy way to support your mission is to buy a T-shirt. Through services like Teespring and Cafepress you can design your own T-shirts and sell them to your fans. Other ideas include making mugs or creating tinier photographs for jewelry. 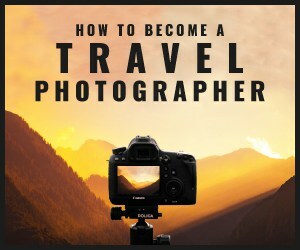 If you manage to earn your first money with travel photography, you can share your knowledge on sites like Udemy and Teachable and collect money for it. Or you can create E-books and other digital information products and sell them on platforms like Clickbank and JVZoo. If your products are good, you can search for affiliates to sell them for you. You have to give a few percent of your profit to the affiliates, but in return you save a lot of time and money. A bit more elaborate, but often more lucrative, is offering coaching or courses that you personally hold in a public place. This form of teaching creates much more trust than pure online courses because the customers get to know you personally. Of course, you can charge higher prices for the extra work. With the methods shown so far, it will take quite a while until you earn your first money. The problem is that nobody knows you as a beginner. And because nobody knows you, nobody has a reason to visit your travel blog or your Udemy course. That is why you should use marketplaces at the very beginning, which are visited by customers who are interested in travel photos. Offer your images for sale on platforms like Tandemstock, Shutterstock, 500px and Getty Images. The use of these services is usually free of charge, you only have to give a few percent of your profit to the marketplace in case of a sale. Your earnings here are usually very low. Use the marketplaces only at the beginning to get your foot in the door and earn your first money. If you have built up a brand for yourself and many loyal fans, switch to services like Fineartamerica. There you can charge higher prices. Believe it or not, there are people who pay you to accompany them on their holidays and capture the most beautiful moments as a memory. With the rise of social media and people wanting higher quality photos to share to their friends, personal travel photographers have made some great money doing in-person photoshoots. Maybe you know someone in your city who wants to build a career as a model through Instagram. Such people constantly need great photos showing them in the most exotic places. To collect references and potential customers, you can offer your services to models and influencers on the basis of a TFP contract. Neither the photographer nor the model earns money here. But both parties can use the images as a reference. Maybe a customer is so enthusiastic about your pictures that he wants more. Make him a paid offer now. If he does not want to pay, make sure you get rid of him as soon as possible. That is just a freeloader who will never pay you. If he accepts the offer, give him as much added value and customer service as possible. If you do everything by trial and error, then you’re going to take a very long time to progress. It makes sense to learn from people who have already learned the hard way and made a success out of what they do. Do you remember NomadicMatt, the successful travel blogger I mentioned at the beginning of this article? He can tell you a lot about how to build and monetise your own website because he knows how to get there safely and guaranteed. Another teacher I can recommend is Laurence Norah. He is a full-time professional travel photographer and runs the website Finding the Universe. He took pictures for over two decades and has over a million followers across social media. He has given talks at travel conferences such as TBEX and TravelCon and has led workshops on photography in locations from Dublin to Sri Lanka. Your education will soon pay off in cash. This is definitely the best way to monetise travel photography in 2019.